“Art is anything you can get away with,” attributed to Marshall McLuhan, flashes on the screen at the back of the stage. This is followed by more of his words: “All media work us over completely.” These concepts set the tone for a highly intellectual study of the work and philosophies of McLuhan and his friend, composer Glenn Gould. Gould and McLuhan met frequently in a house on Wells Hill Avenue in Toronto. Choreographer Vanessa Goodman grew up in that same house and has now created a dance work that explores the idea of the medium being the message and how dance functions as a medium in our current digital communication landscape. On an all-white stage surrounded by fluorescent bar lights, seven dancers moved in evolving sequences, at times in unison and at times flowing as a unit as if connected by wires. A four sided plexiglass cone, reminiscent of an upright phonograph, joined them on stage with McLuhan appearing projected inside it as a talking head. Black and white documentary footage was spliced together and increased its speed until it was unintelligible. In another scene, the dancers took turns lip synching a commentary on culture and big business. As if they were a part of the digital fabric of our communication networks, the dancers moved through projections of rapidly moving lines traversing the stage and strings of letters that resembled computer code. 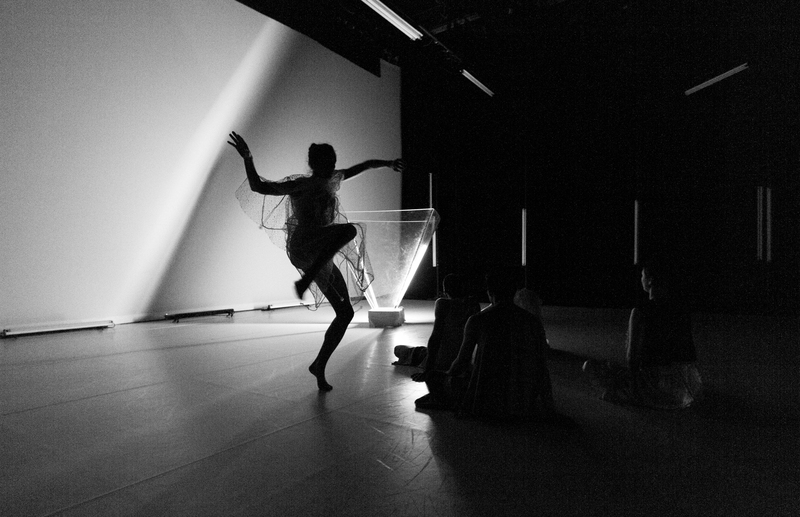 As part of the feedback loop of communication, the dancers showed that their medium I a message in itself while also including the audience in a continuous circuit of meaning. Goodman has created a dense work full of deeper meaning that may not be obvious upfront. The elements are all there, but at times it is difficult to understand how they are related or if there is a desired message. Perhaps it is all up for interpretation; a work of art you can get away with that is its own message. The hour long piece ended with a beautiful, tender duet set to soothing piano notes as the stage returned to a state of calm.